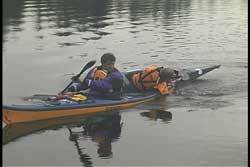 There are many different methods for towing an injured, sick or fatigued paddler. Contact towing may be one of your towing options. As the name implies, your are in direct contact with the towee when using this method. 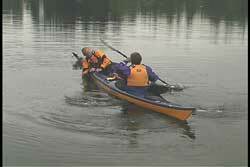 I believe that contact towing should be a "must know" in every paddler's repertoire of skills. One of the main reasons for my belief is contact towing gives you an immediate answer to the question, "What do you do when you do not have a tow rope?" The other reasons why I like contact towing are: easy to use, quick to set up, provides support to the towee if they have difficulty in staying upright and can be used when there are only two paddlers. In fact, this is one of the few towing methods that can be used in a one-on-one situation that provides support for the towee. If you have a towee that is seriously seasick or unable to stay upright, you need to provide a stable platform for them. Contact towing gives the ailing paddler a place to rest while you move them to your destination. There are four different configurations of contact towing that all accomplish the same basic purpose, but each one has certain advantages and possible disadvantages. Which configuration you use will first be dictated by the two boats in use and then by other considerations. I will discuss my experience since I have tried and used each of the four options in different conditions. Keep in mind that my comments are based upon the boats that I was using. Your experience can vary depending on the boats in the equation and the conditions in which you find yourself. As you will see, boat length, specifically the distance from the cockpit to the bow and the cockpit to the stern, will be a major factor in how you choose to set up the contact tow. Your ultimate goal is to be able to paddle effectively on both sides without having the towed kayak hampering your paddling efforts. Regardless of which configuration you do use, a portion of the towed kayak will be next to your cockpit. How much of it is by your cockpit comes down to the design features (boat lengths) I mentioned above. 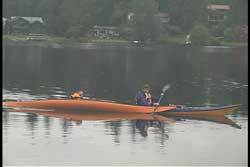 In these pictures, I am in a 16"10" kayak (with a drop skeg) towing a 17'7" kayak (with a rudder). Remember, it is not only the total length of the kayak, it is the cockpit to bow and stern distances that can dictate the best configuration. When I name the configuration I will name the section of my kayak first and then the section of the kayak being towed. Also keep in mind that I am 6'7'' tall so I do have a longer reach than most paddlers. In addition, I like to paddle with a 230 cm paddle. The recent trend in shorter length paddles can affect your options in contact towing. Here is a stern to bow configuration. The towee is resting on my stern and their bow ends up past my cockpit. As you can see, I am still able to paddle forward. However, I did have to adjust my stroke to be a little wider out to the side when paddling. You will also notice that the towee is keeping his kayak on edge to make it easier for me to paddle over his bow. The towee is also using his abdominal muscles to keep his bow next to my kayak as we paddle forward. You can also use a short tether to hold the towee's kayak next to your kayak. See USK article, "Using A Deck Sling." What I like about this configuration is clarity of vision, better maneuvering and better speed when the towee rests on my stern. I also like not having his rudder next to me banging into my kayak or around my hands when paddling. I dislike having someone behind me, because it is almost impossible to visually monitor them when they are behind me. I cannot do an 180 degree exorcist turn to look at them on my back deck. I can however, manage verbal contact. Here is the second stern set-up. This time it is a stern to stern configuration and the towee's kayak has his rudder next to my cockpit. I can use my deck sling as before to attach his kayak to my deck. This may be a viable option for you if the towee's kayak has a short back half of their kayak. As before I dislike the non-visual monitoring, but this is even worse because the towee's back is facing my back. That means that there ears are focusing to the rear and mine ar focusing to the front. On a windy day communication is very difficult even though we are so close. In both of these stern configurations, the towee may have to deal with a rudder if the towing kayak is so equipped. Hanging around rudders in rough conditions can cause some cuts do the the metal and cable components. It also means that the kayak doing the towing may not be able to use their rudder effectively if the towee is resting there. As a side note, that is why it is so important to learn how to steer your craft without using a rudder and skeg in case either ever malfunction on you. When you are in the bow to bow position you have great visual contact and the best verbal contact with the person being towed. If you paddle into a head wind and the towee had garlic for lunch, I do not recommend this position. Especially if the seas are rough and you are prone to seasickness. While I like the communication aspects of this position, I have found this configuration a slower moving one. If you move the towee's bow close to your cockpit, which you need to do in order to take strokes, you run the risk of opening a gap between your bow and the boat being towed. That gap cannot be too big because the towee needs to rest on your bow. That gap is similar to paddling forward with an open "V" in the direction in which you are paddling. The size of the "V" can be decreased by having the towee keep their kayak on a greater edge. This allows the kayaks to stay closer together. In general, I found steering more difficult when the contact two was off of my bow. In this last configuration, we have the bow to stern position. As in the stern to stern example, the rudder of the towed kayak is right by my cockpit, so I have to deal with the challenges I mentioned earlier. I also still have that open "V" I just described above. With respect to visual and verbal communication, I can see the back of the towee, but I don't have the advantage of looking at their face, which can tell you a lot about the status of the paddler in need. As for hearing me when I speak, it is the same as if you were in a tandem kayak. The person in front is hard to hear if they look forward while speaking. The person in front has their ears focused forward so it is more difficult to hear the person from behind, especially in head winds. As always, I recommend you practice all four of these configurations with your regular paddling partners to see which ones work best for you before you need it. When you practice these contact tows, you will see that trying to keep the towed boat close to the cockpit of the towing kayak takes a lot of energy over the course of a few miles if you did not have a tether. 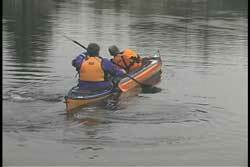 If you had a seasick or weak paddler, they may not have the energy to manipulate their kayak as needed. That is why I recommend you have a deck sling or something you can use to tether the towed boat close to your cockpit. As you can see, contact towing has certain advantages and some challenges. The more you practice contact towing with different size kayaks the better chance you will have to refine your technique to be more efficient just in case you end up having to use this towing method for many miles.